Brad Pitt insists he had "no choice" but to shave off his beard and showed off his new look at the Producer's Guild Awards in Beverly Hills. 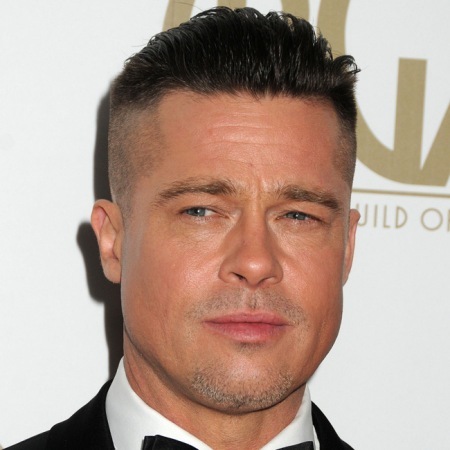 Brad Pitt has had to shave his beard off for a film role and we’re not complaining! The 50-year-old actor showed off his new look at the Producers Guild Awards at the The Beverly Hilton Hotel but insisted he didn't want to get rid of his facial hair. "It's for a part. It's not a choice!" The 12 Years a Slave star, who first debuted the look at the Screen Actors Guild Awards last week, has been sporting a long beard for months and it's not the first time he's had to get rid of his facial hair for a film role. In 2011 he had to be clean-shaven for his part in Moneyball and it's not yet known which role he has had to sacrifice his beard for this time. Brad, who produced 12 Years a Slave alongside Anthony Katagas, also spoke about co-star Lupita Nyong'o at the ceremony last night, who mentioned him in her acceptance speech for her Outstanding Supporting Actress award. "She's very special. [A] very special young lady. We're going to see great things from her." Brad gushed about the awards season success of the film, saying: "It's great. It also ensures that more people are going to see it. And in my mind this is a film that only comes along once in a decade and everyone should see this. It's that good. It's moving, it's inspirational. It's why I wanted to go into film in the first place." Brad and the producers of 12 Years a Slave were tied with the makers of Gravity for the Outstanding Producer of Theatrical Motion Pictures award at the ceremony.